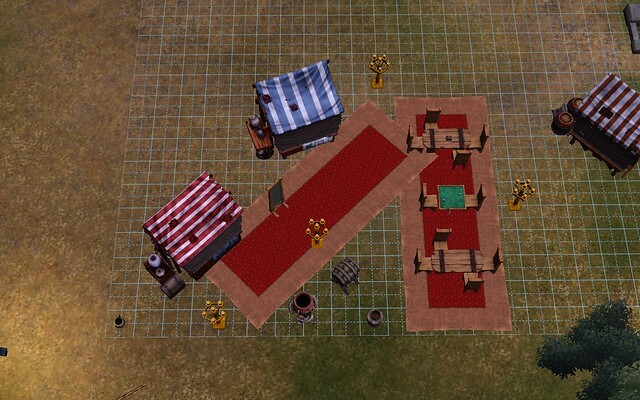 This is a sample starting Market (using the Unfurnished option) that grants the +25/- Nicely Decorated buff. Proximity to Environment items appears to be a factor in determining what kind of buff is granted. In this particular starting layout, we have placed the market as close as possible to the path to the Village. A Merchant standing next to the Blue Tent (where they always stand, and it is the tent they move to when a sale is made) can get a +25/- Nicely Decorated buff. If they walk a little outside this area past the Blue tent, that buff disappears because it is now too far from enough Environment influencers. We have a music box on the dining table nearest to the Blue Tent. AI Sims like to keep that device playing, and when it is not, they frequently all race for it and you will see some frustrated sims because the device is "not accessible" (i.e., some other sim is already in line to use it). 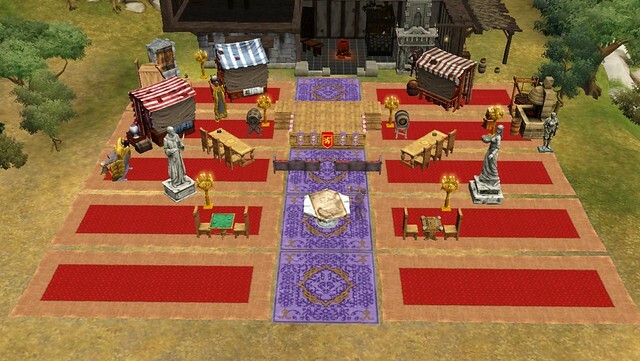 Since the Merchant can make both money and levels quite quickly, it is not necessary to upgrade the Decoration buff to the +40/- level quickly, but we should do so early in a Kingdom for the same reason we aimed for Beautifully Decorated in the Throne Room: It benefits other heroes. 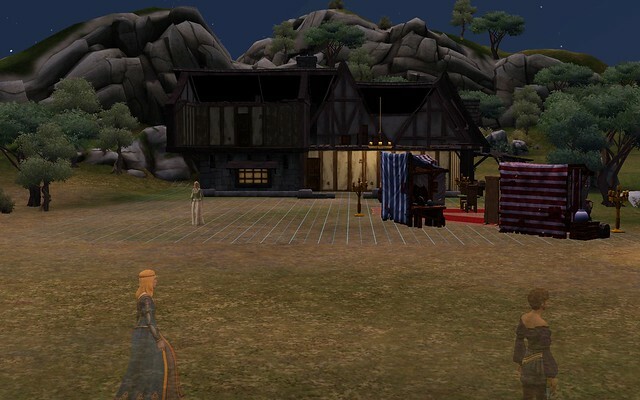 The central location of the Markets; the availability of space; and the easy access to cash as the Merchant means we can put various profession-related structures (such as a stage for Bard performances) in the same area to benefit from the Decoration buff. A sample layout is below. Not all furnishings are vital here for the Nicely Decorated buff almost everywhere in the market square, although at least two items of Environment 7+ are a necessary condition. We have also tucked in a desk for the Bard behind the red tent, and a mirror left over from the earlier layout.